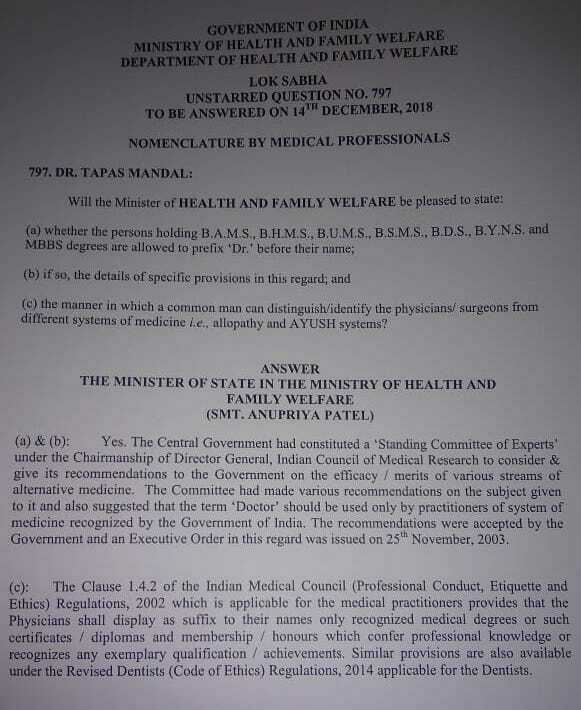 Practitioners of Modern Medicine, Indian Systems of Medicines, as well as Dentistry, who is recognised by the central government- all can use the prefix “Dr” in the country, Minister of State ( Health), Shri Anupriya Patel Clarified in parliament. Earlier MCI and IMA demanded to restrict Dr Prefix to allopathy practitioners only. The minister was addressing to a question asked by the Lok Sabha Member Tapas Mandal who questioned which all practitioners can use the ” Dr” tag before names and how can a common man differentiate between practitioners of different paths in this case. She further added that this decision comes after the central government under the Directorship of ICMR had constituted a committee to provide a recommendation on the effects/benefits of a various system of medicines in the country. The association issued a recommendation which says that the prefix ’Dr’ can only be used by a practitioner of that system of medicines that are recognized by the central government. The recommendation had been accepted by the government, which has already issued an order in this regard on November 25, 2003.